My lovely wife keeps a to-do list. It’s several pages of single-spaced, detailed information about the duties ahead, designed to keep her on task and fully aware of all impending appointments. 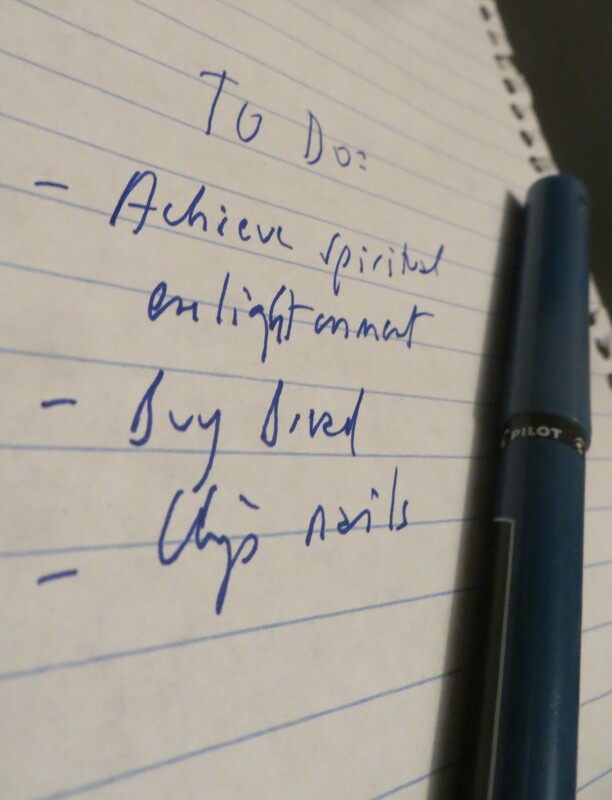 Most of us keep to-do lists, of one sort or another. We need them and, well, we like them. We enjoy writing things down and then crossing them off with a flourish, and feeling a surge of accomplishment as we do so. We also know that if we don’t keep track of this stuff in our complicated worlds, we’ll forget something important. So, we walk a fine line between trying to account for all of our duties and obligations without ending up with a list so long that it sends us into a spiral of soul-crushing despair. It’s also important to distinguish between what is immediately achievable, and therefore suitable for a to-do list, and what is not. “Lose 30 pounds” isn’t really a proper to-do list item. As our species moved beyond hunter-gatherer status into settlements, the need for reminders became apparent. I suspect that writing was develop precisely so that early humans could prepare the first crude to-do list. Somewhere in the Valley of Kings, waiting to be unearthed by archaeologists, are clay jars of papyrus to-do lists for the Pharoah Ramses II prepared by ancient Egyptian scribes. The hapless citizens of Pompeii likely were buried by volcanic ash because the Roman who was supposed to be watching Mount Vesuvius was preoccupied with preparing a to-do list instead. As the world has become more technological, to-do lists have become more advanced and have proliferated. In the ’80s and ’90s, the hyper-organized among us became addicted to using Franklin day planners to chart and control their activities. Then, with the advent of personal computers, and Google calendar and electronic task lists, to-do lists moved into the digital realm. Now they also appear on our smart phones, using gentle chimes or marimba music and flashing messages to remind us of impending meetings. Soon, I expect, Apple will develop an Apple Nagger app that will remind us, in increasingly insistent fashion, that we have just got to do something. I ask you: how many of us have to-do lists that begin with a statement like “Check to-do list”?